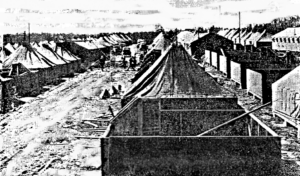 In 1942 PRISIONERS OF WAR begin the task of building their own quarters on the facility that WOULD COME TO BE KNOWN AS DGSC (DEFEnce General Supply Center). the detention camp was in operation from 1941 to 1945.
cks, athletic field and place of worship. A barbed-wire stockade circled the camp which was under surveillance by American M.P. guards who were completed armed. Some area residents, thought the prisoners may be living a good life at the camp that sat right in their community. According to the “Golden Anniversary” edition of Elk Horn, a magazine distributed within the DGSC facility, the army activated a new supply depot at the site of a former plantation south OF Richmond on U.S. Highway 1. After the attack on Pearl Harbor and Americans got into the war the captured began arriving in the states. Once they were bivouacking here the Department of the Army indicated that the POWs would be treated as the Geneva Convention dictated. The food for the German captives consisted of meat and corn such as our own soldiers would have eaten. But he wants what he ate from the time he was growing up: the potato. The Nazis wanted the potato added to the menu, but that was an item already rationed to civilians in the U.S. Col. Humphries, who commanded the post wrote to the community that no civilian jobs would be replaced by prisoners as long as the civilian employee was doing a good job. Taken from Elk Horn Magazine, DGSC May 1992.